Just a Little Ink: Just for the "case" of it! Just for the "case" of it! 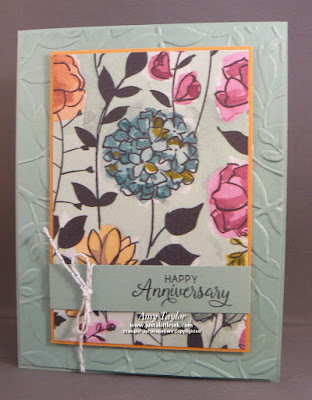 I'm sharing another card that I cased (copy and share everything) from my friend and fellow demonstrator Leanne Livingstone. I loved the layout and when I saw the Share What You Love Designer Series Papers, I knew they would look so good with it. I think this layout would be great for using up all that gorgeous paper that we all (I know you have a stash somewhere) have, but hesitate to use because it's just so pretty! The card goes together so quickly that you can create a bunch in no time at all. Go give it a try, and then share your creations with me.